Hello and welcome to the Pretty Little Studio and Love My Tapes Blog Hop! We thought it would be fun to combine forces and share with you projects highlighting Pretty Little Studio whimsical goodness paired with the versatility and trendiness of Love My Tapes. During the Blog Hop, you will be visiting blogs from both Pretty Little Studio and Love My Tapes Design Team members. We promise to bring you a hop FULL of inspiration and creativity. 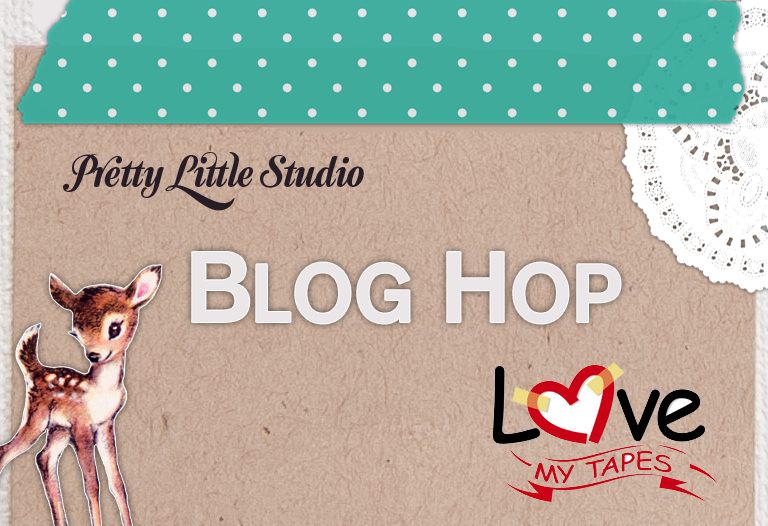 The Hop will start on the Pretty Little Studio blog and end on the Love My Tapes blog, so head on over to the Pretty Little Studio blog if you are just joining in. Let's start hopping! You should have arrived here from Candice Elliott's blog! Christina Collins YOU ARE HERE! Pretty Little Studio products go perfectly with the gorgeous tapes that Love My Tapes has to offer! I just fell in love with this navy blue tape, and knew I wanted to make a tag with it. Remember those pretty little studio embellishments I put together last week? 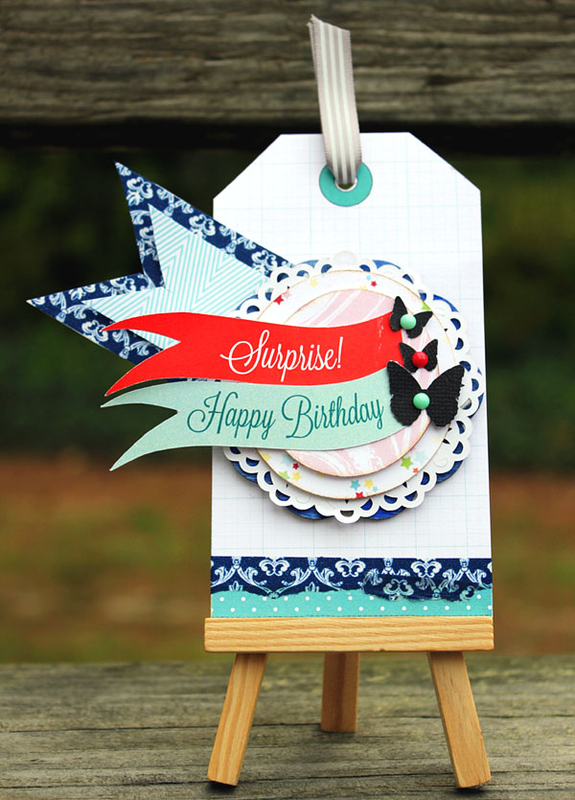 I put one of them to good use, and made this beautiful birthday gift tag! The navy blue tape comliments the teal and reds of the pretty little studio products so well. I just love it and can't wait to dress up a birthday package with it! And what’s a Blog Hop without giveaways? Be sure to visit all the blogs, including the Pretty Little Studio and Love My Tapes blogs for a chance to win some PLS and LMT goodies (like a giant box of trendy goodness from Love My Tapes and Pretty Little Studio)! 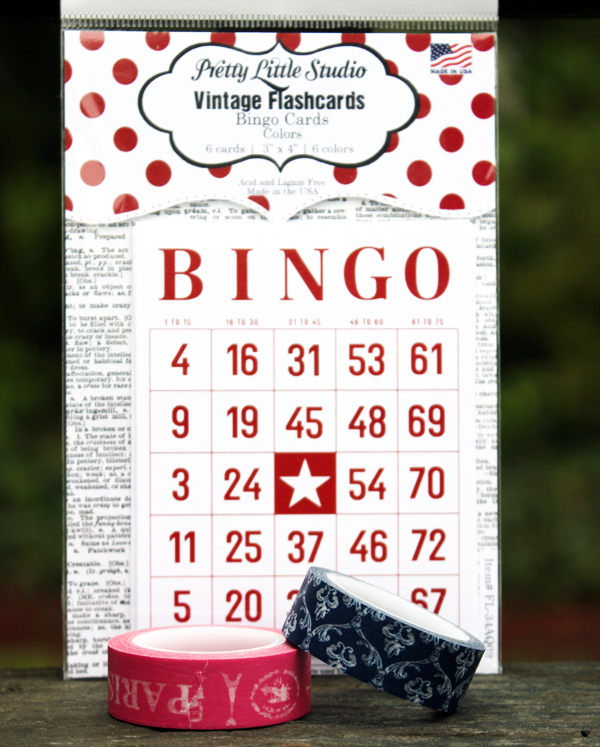 In addition, I'll be giving away a pack of these adorable Pretty Little Studio Bingo cards and two gorgeous rolls of Love My Tapes washi tapes. To win - just leave a comment on this post by May 2nd. We will announce the winners of the PLS and LMT giveaways on May 3rd, so be sure to be watching for the announcements. Your next stop is Heather Adams! This is sooooo pretty, Christina! I like the pops of black. What a striking tag! I love the wavy pennants and the black butterflies/enamel dots. It really feels like there is movement to this piece! what a great tag!!! love it!! Love your tag! Great prize too! I just got some of these tapes. Now I have so many ideas on how to use them. woot, woot! just beautiful! and great prize! that tag is oh so super cute! Super cute tag! THanks for the chance to win! Cute! I haven't ever seen the navy tape! It's so pretty! Love the cute layered embellishment on your tag and the use of the Washi is perfect! Loving this gorgeous tag! I think the butterflies really make it pop! Your butterflies look really nice on the simple tag. I like the ribbon, too. Love the colors in your tag. Very nice! I love the combo of banners! Such a sweet, happy design! Lovely tag. I love the washi border. so much fun ... what's not to love? nice design - love the layers & use of washi tape! thanks for the chance to win!